Back in June, I met with long-time online friends in Newark, DE, for the first-ever Word Sharks Conference. In attendance – J.J. Brown, Elizabeth Cottrell, Pamela Wight, Jessica Pettengill Messinger, and Barbara Forte Abate. Since then, we have stayed in touch sharing blogs we like, having book discussions, and sharing other resources and insights. Out of one of those conversations came some fantastic insight into Twitter by J.J. Brown. She shared her philosophy and advice on how she uses Twitter. I thought it was so good, I called “dibs” on sharing it in a blog. I love twitter because it is a free and open conversation that’s so fast-moving. Twitter is quite famous for NOT being a place to sell books or much of anything else. So, I don’t have advice about how to use twitter to sell books. Being active on twitter is a wonderful way to meet writers and readers, and exchange thoughts on the writing process and story ideas, as well as inspiration. And once in a while I get a tweet asking to review a book of mine, or to be interviewed on a blog, or submit a post for a website, or a story to an anthology, which is fun. I can’t count the many interesting people I’ve met and shared views with on twitter, and sometimes later in-person as friends (none of whom were creepy). Be interesting and super brief; don’t repeat identical tweets. Talk about yourself and the books you’ve written, but not ALL of the time, just sometimes. Post provocative things about writing, about your books, and the news – things people react to. Share other writers, artists, and thinkers works, at a good ratio. Tweeting 5 of others’ things then 1 of yours works well. Use a photo in your original tweet so more people will see it. This magnifies your reach because more people look at pictures than words, even on twitter. Tweet quotes from famous authors or artists who inspire you, just to share the joy. After you tweet something original or important, stay on a few minutes to respond to any replies. Retweet things others post that you think need a broader audience because they’re great, funny, or important. Say something insightful about any link you share on twitter, don’t just hit the Tweet button though it’s tempting. When someone tweets your work or retweets you, thank them via direct message (which is private) or tweet (which is public). When people react to you, tweet back like a conversation. It hurts to be ignored there like in any conversation. Never argue on twitter. Yes, sometimes a person will be mean to you. Ignore them. Praise, or add a new thought, or brood away silently. Use #amwriting (for insights, personal progress) #amreading (for reviews) and other hashtags to enter writer’s conversations, then respond when people join your thought stream. Follow people who follow, retweet, or comment to you, IF you’re interested in their twitter feed. Don’t follow people who offer to buy twitter followers or increase your reach. That is kind of spammy messy stuff I don’t get into at all. Seduce people you’re most interested in on twitter, tastefully, by retweeting and commenting on their tweets. Think of the new contacts as friends and connections, not followers or fans. Don’t look at your live stream, it’s a jungle in a thunderstorm. Make lists of groups like writers, editors, publishers, artists to organize your new friends. Do look at your lists’ tweets, your favorite people’s tweets, and any hashtags trending on that day that stimulate you. Keep an eye on the clock. I limit my twitter socializing to about 30 minutes on a free day, 10 minutes on a busy one. I hope this is helpful. I started on twitter about three years ago, when I started publishing books. At first, I was baffled. Now I love it. But I keep it to short doses. And only log on when I’m in a pretty good mood. Jennifer J. Brown, PhD, is an editor at EverydayHealth.com by day, and writer of books and short stories by night. She completed a PhD in genetics and worked as a research scientist for 20 years before turning to writing. In her fiction writing, she is obsessed with exploring death and the meaning of dreams. Published author of seven books as J.J. Brown, she was born in the Catskill Mountains of New York and lives in New York City. Find out more about J.J. Brown’s book news at her author website. Will you be remembered after the writers’ conference? I am attending a writer/blogger conference in Fargo, North Dakota, this month. I looked back on my writers’ conference tips, written last year. I also wrote about “branding” back in 2013 – you can see that link here. I’m not going to use any entry-table name tag, no way. I made my own. You guessed it – it has a shark on it. I will have The Word Shark biz cards and give-a-way pens with a shark charm (people will take me home with them). I discovered and joined the FB group, North Dakota Bloggers. There has been some chit-chat about the conference, and I have connected with a handful of attendees as well as presenters. Before any conference, you get a who’s-presenting email. Do look up these people, connect with them on social networking, follow their blogs ahead of conference time. One of the presenters at this conference is the editor of a local, regional magazine. Will I have a couple of articles to hand her? You bet your dorsal fin! It’s all conference I’m about! How do you prepare for a writers’ conference? What’s your favorite thing about attending a writers’ conference? Cool shark-charm pens custom made by The English Rose. The shark is gentle as a kitten! His bite is worser than his bark. Lara and Stacy at a great conference (not in Vegas). I attended a conference in Vegas a few years ago, and I was appalled at how people were dressed. T-shirts, shorts, flip flops. The chick at the greeting table wore a blouse cut down to her navel. I didn’t need my imagination. Fifty percent of the people I met didn’t have a card. Most of the people I met were dressed like beach bums. Unfortunately, about 50% of the people I met and mingled with were drunk most of the time (okay, it was Vegas, but still!). A bad impression? You bet! If a huge conference in Vegas or NYC scares the heck out of you, look for a smaller, local conference. Better to flex your conference muscles when you’re not too overwhelmed. I wear a blazer and nice blouses over new jeans. Wear comfortable shoes – my comfortable shoes are dress Oxfords. Have cards or bookmarks to hand out. If you don’t have a publication, you can still print your name, blog address, Twitter handle, etc., on a card. Collect cards from everybody and follow up with these people when you get home with a simple note. After you collect a card or bookmark, remember a few specifics about that person (editorial chat, historic book chat, where you met, we laughed over the buffet). Jot these notes on the back of their card. Also helpful, a one-sheet. Suzanne Hartmann has a great article (with her own example) on her blog. Click here for Suzanne’s example of a one-sheet. Try to talk to as many people as possible. Even if the first few people you meet are crazy-fun, hop around. Participate in as many activities as you can. I suggest a carry-all for what you collect along the way – books, bookmarks, brochures. Consider a satchel with a shoulder strap in case you need two hands (one for coffee, one for shaking hands). Since electronic devices are not 100% dependable, carry a small pad and a few pens. Carry water and a few small snack bars. It may be hours before you get a decent meal. Show up on time for sessions. Turn off your cell phone. Pay attention and participate in discussions. Don’t talk only about yourself, your blog, your book, your this and that, but do have a sentence memorized about your book or project, in case you are asked. Don’t be pitching all the time – ask others what they are working on. Before the conference, Google the scheduled presenters and write a few small facts about them on note cards. I did this for the Vegas conference and consulted these cards before each session – it was helpful in a few cases when I got to talk one-on-one with a presenter. With most conferences, alcohol gets introduced into the equation. 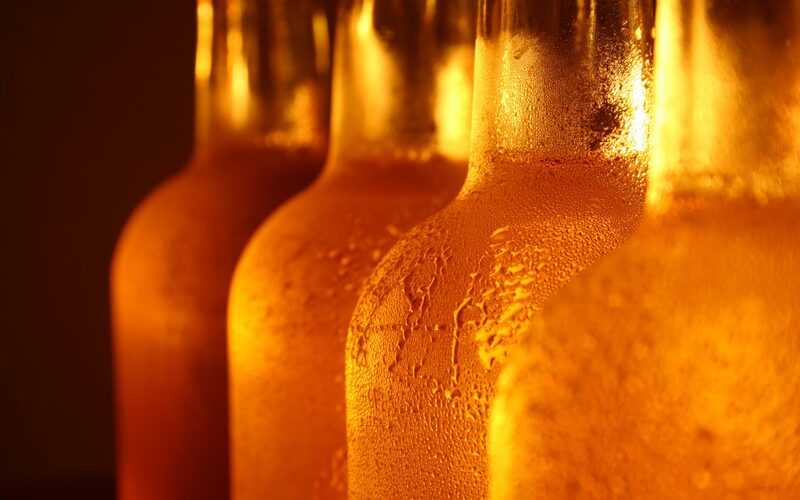 My advice – don’t drink too much. One glass of something then switch to bottled water. You don’t want to leave a bad impression because you made a fool of yourself. It would be silly if you wrote only horror and went to a women’s lit writing conference or if you wrote only poetry and attended a mystery writers’ conference. Check out these conference lists and you are bound to find the right conference, in a good area (close to home), and for the right price. Opening photo from Stacy Stenberg Jensen. Stacy is a writer and blogger in Colorado. Her new website goes live in September. Lara Schiffbauer is a writer and blogger. Her first book, Finding Meara, is available on Amazon. Have you attended any writers’ conferences? What advice would you add? Hi. I’m Karen. This beautiful woman with me in my Mommy. I am going back to my maiden name – Sanderson. I will publish a collection of poetry (hopefully this year) with the name that Lois Jane Holmes Sanderson gave me – Karen R. Sanderson. Karen Sanderson being silly…circa 1960-something. After the poetry, I plan on pubbing a book of historical/familial short stories, after that a collection of horror. I realized I didn’t want my ex’s name on any of my work. Especially since he was no cheerleader or even tolerant of my dreams to write or publish or edit. Six freaking months old…I’m on the typewriter already! And I have an audience! Except where you used to see Elliott, you will start to see Sanderson. 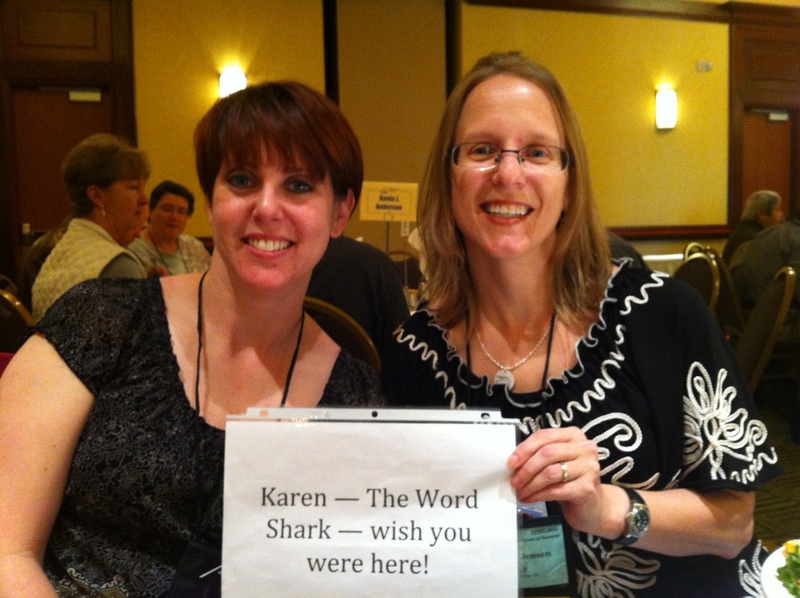 Over the next few weeks I’ll morph from Karen S. Elliott, The Word Shark, to Karen R. Sanderson, The Word Shark!